Leben wir am Ende dieser Zeit? : Nuklear-Angriff-Übung in L.A. am 27. April oder 5.6. Mai 2013??? Nuklear-Angriff-Übung in L.A. am 27. April oder 5.6. Mai 2013??? 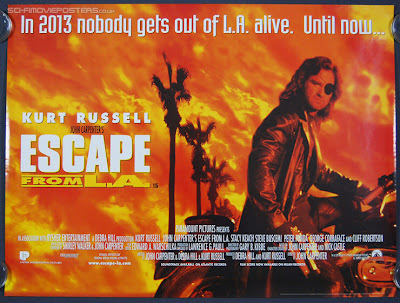 Notice the date on this old 1996 Kurt Russell Escape from L.A. movie and the fact that nobody gets out of L.A. alive. Martial law trapped everyone in L.A.
Weird how satanic incidents revolve around certain numbers.This year’s Boston Marathon was the 117th. Pullman, WA across the state line is 117 degrees west longitude. Lewiston, ID 30 mi south is 117.0167 west longitude. And they will have the first responders all attending classes on how to creatively deal with zombies and UFOs. Friends, the New World Order is getting us ready for the UFO (demonic) invasion. These coincidences are waaaaay to great. The first simulated test of a terrorist attack on a U.S. nuclear power plant was a success, federal officials said on Friday of the event that was coincidentally scheduled a day after the Boston Marathon bombing on Monday. The test's location at Three Mile Island outside Harrisburg, Pennsylvania - the site of the worst commercial nuclear accident in U.S. history - had no special significance, according to state and federal officials. The test on Tuesday simulated an attack by a group of eight armed men, according to Peter Herrick Jr., spokesman for the Federal Emergency Management Agency. In November 2011, the Nuclear Regulatory Commission required that the country's 65 nuclear power plants test their preparedness for terrorist incidents every two years. The next 16 months were spent planning the challenge, and the simulation was put to the test for the first time on Tuesday at Three Mile Island, said Steve Barr, a preparedness inspector with the commission. Authorities said every challenge presented to the plant's personnel was met, but when asked for specific examples they declined to provide details. Both Herrick and Barr said the plant was rated on each step it took to maintain safety and security and it consistently met the successful standard of "adequate." FEMA will release the full test results in 90 days and the U.S. Nuclear Regulatory Commission will announce its portion of the findings in 45 days. Tuesday's test involved more than 1,200 participants in 76 municipalities and 15 school districts, said Alan Brinser of the Pennsylvania Emergency Management Agency. The site of the next terrorist simulation has not been released publicly, Barr said. Each plant operator will choose their reactor's simulated terrorist scenario, although the choice must be approved by the commission. Three Mile Island in 1979 became the site of America's worst commercial nuclear plant disaster when one of the reactors melted down, prompting more than 100,000 people to voluntarily flee the Central Pennsylvania area. The entry below is from someone's Facebook page. LA Nuke Drill on April 27,any connection to Facebook Nuke Memorial Page for Apr27?